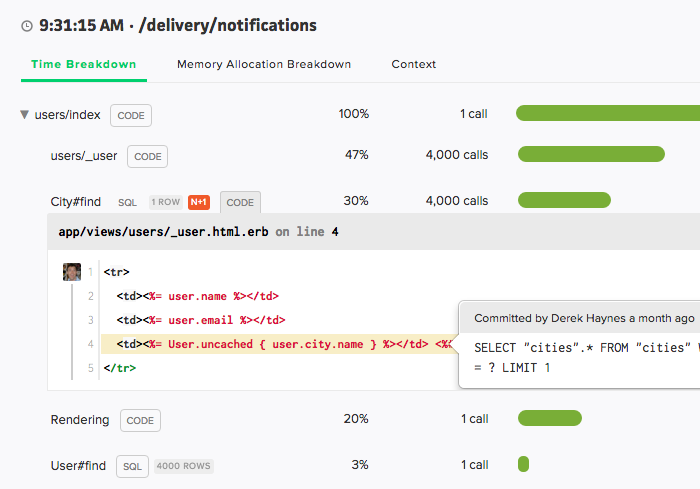 Quickly solve slow queries, memory leaks, and CPU bottlenecks in your Rails app. Pros: Scout has been a breath of fresh air after coming from the world of New Relic. We're paying ~40% less than we were with New Relic, and Scout has made our dev team more effective, as the most common sources of performance issues are surfaced right on the Scout dashboard, so we don't have to toggle back and forth through countless charts to find the issues. Cons: The one downside of Scout is that they don't do everything -- they've decided just to focus on APM and do that extremely well, so they don't have the same breadth as New Relic. That being said, Scout integrates well with Sentry, and using a combination of the two has still been significantly cheaper than New Relic, and I think both Scout and Sentry's solutions are better than New Relic, so for us it was well worth the switch. Overall: Scout helped us save money on APM, and our developers have found it much easier to use. We spend less time doing dev / ops and more time coding. Pros: Easy to setup, easy to use. Nice email updates about performance changes day-to-day. Integrates into local apps as well, helping avoid deployment of performance issues. And a great support team! Cons: The free tier restricts the duration of data access. Makes sense for their business (and I'm glad they even have a free tier), but it does make it tougher to track performance over longer time horizons.